A physical water is a cuboid shaped area inside which water interaction effects are simulated. The physical water is usually used with water objects: you can add the physical water node together with a water node to indicate an area where physical interactions will take place. Note, however, that you cannot simulate waves by using the physical water. The water will affect only objects, to which a cloth body or a rigid body are assigned. 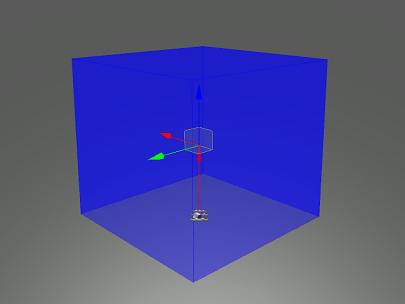 If the rigid body is used, a shape should be also assigned. However, cloth bodies cannot float in the physical water: they can only go with the water flow. Also it is possible to generate particles in the contacts between the rigid bodies and the physical water (in order to create, for example, foam on the water or water splashes). 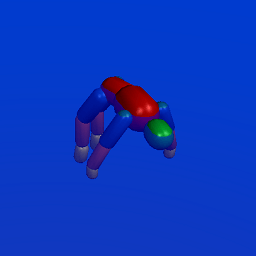 This requires that the ObjectParticles node must be added as a child node to the PhysicalWater node. You cannot generate particles in the contact between the water and the cloth body, since cloth bodies cannot float in the water. Bodies with different physical properties behave differently in the same physical water. Therefore, in addition to editing physical water parameters, you should adjust parameters of the physical body in order to get the expected result. 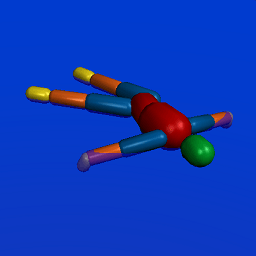 Physical bodies of objects participating in the contact with a physical water can be obtained via UnigineScript. Also you can get the depth of the object submergence, the force applied to the contact, coordinates of the contact point and the relative velocity between the object and the physical water. By using the physical water, you can create, for example, flows in the ocean. On the Menu bar, click Create -> Effect -> Physical Water. Click somewhere in the world to place the physical water. 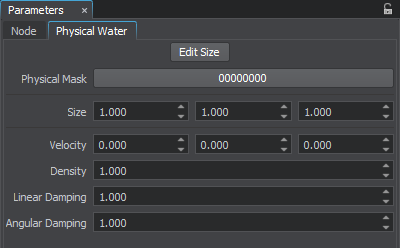 The new physical water node will be added to UnigineEditor and you will be able to edit it via the Parameters window. By default, the size of the node is 1×1×1 unit. 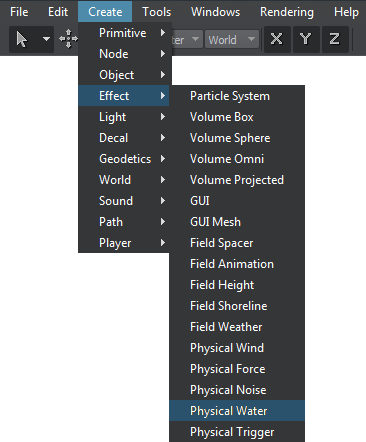 Toggles the editing mode for the physical water node. 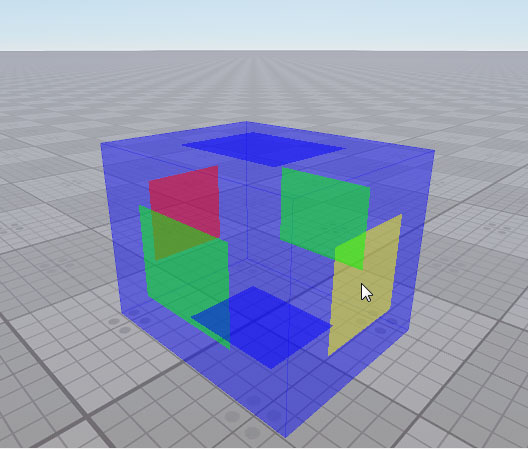 When enabled, the physical water box sides that can be resized are highlighted with the colored rectangles. To change the size of a side, drag the corresponding rectangle. Physical mask. The physical mask of the physical water must match the physical mask of the physical object. Otherwise, the physical water won't affect the object. Size of the physical water box along the axes in units. Velocity of the flow in the physical water along the axes. Density of the physical water. It determines buoyancy of objects that float in the physical water. The higher the value, the higher buoyancy of the object. The lower the water density, the deeper the object submerges into water. The density and the mass of the physical body also affect buoyancy of the object. Value indicating how much the linear velocity of the objects decreases when they get into the physical water. The higher the value is, the lower the linear velocity will be. Value indicating how much the angular velocity of the objects decreases when they get into the physical water. The higher the value is, the lower the angular velocity will be.